Phoebe (left) and Hermione (right) are sisters and arrived at the Rescue, because their owner could no longer care for them properly. Phoebe and Hermione are new to the Rescue, so are a little shy, but they seem very sweet girls and we are sure that once settled, they will make lovely family members. 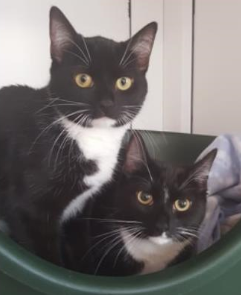 Phoebe and Hermione are looking for a home together, as they are close. A home with no young children, but they could live with other friendly felines.